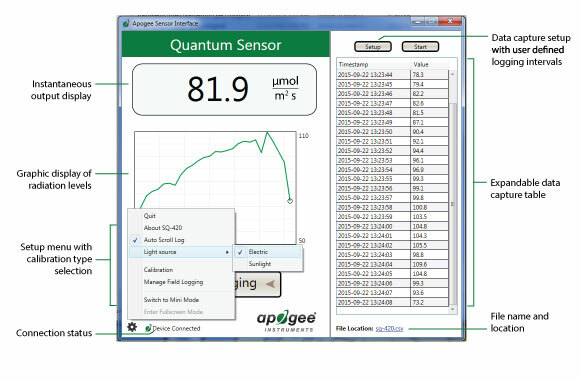 The new SQ-420 smart quantum sensor can be connected directly to a computer for taking spot measurements or graphing and datalogging real-time PPFD using the included ApogeeConnect software. The sensor can also act as a stand-alone PAR datalogger by simply connecting it to most standard 5 V DC USB power plugs. Internal memory within the sensor head is capable of storing 10,000 user-specified periodic measurements that can be downloaded as a CSV file to a computer for analysis. The sensor can be connected to a desktop or laptop computer via USB 2.0 type A plug, to be used with the ApogeeConnect software (Windows compatible, XP and later; Mac compatible, 10.10 and later). The included Apogee software gives the user control of data logging and calibration settings, provides a real time output display and graph of PPFD measurements and allows the data set to be saved as a csv file.